Registrar of Scholarships, Kingsley Agyemang, has cautioned persons seeking Government of Ghana Scholarships to avoid engaging the services of middlemen who promise to help them. According to the Registrar, the Secretariat does not engage the services of third parties in awarding scholarships to those who qualify. He gave the warning yesterday after being adjudged the third best Chief Executive Officer (CEO) by the Association of Aides to Regional Chairmen of the New Patriotic Party (NPP). “I want to sound a caution to all Ghanaians. Before I took office there were news of people trying to act as middlemen and agents for the scholarship secretariat. I want Ghanaians to know that no person has been appointed to act as a middleman or any agency created by the secretariat to do our work for us. Our services are entirely free and nobody should give any money to anybody who might say he/she can influence the secretariat to give the person scholarship,” he said. Mr. Agyemang said in order to ensure that scholarships are brought to the doorsteps of Ghanaians, the newly established District Scholarship Review Committee would ensure that applicants access scholarships at their various districts. “Secondly, the District Scholarship Review Committee will ensure transparency and fairness so that those who hitherto could not access can now be eligible for selection,” the Scholarship Registrar said. “The Districts Assemblies will be responsible under our guidelines for publishing scholarship openings using the district information channels such as community information centres, church announcements, mosque publications, among others. It will receive applications, shortlist applicants within their enclaves who will then appear before them,” Mr. Agyemang explained. 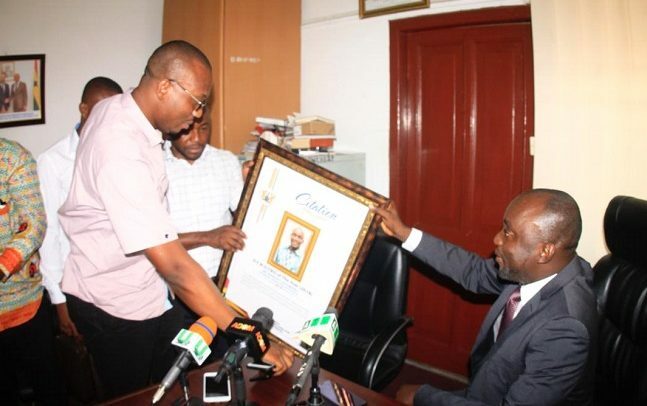 According to him, the District Scholarship Review Committee will be made up of the District or Municipal Chief Executive officer, a representative from the traditional authority, which is very dominant within the district, a representative from the Ghana Education Service or any tertiary institution in the district and two other representatives to be appointed by the Scholarship Secretariat. “After the interview had been done by the district, a recommendation will be made to the Central Scholarship Review Committee Secretariat which will then award the scholarship to the deserving applicants,” he said. He said the neutrality of the District Scholarship Review Committee panel would be maintained. “This is a district affair, a local governance affair. This is something a person like me who sits in Accra cannot control. It even doesn’t lie with the MCE or DCE to even decide who gets the scholarship because there are traditional appointees and other reps from GES who are apolitical. Besides the work of the District Scholarship Review Committee is to recommend which is subjected to a further scrutiny by the Central Scholarship Review Committee made up of more than 10 institutional representations,” he said. He said a debt of GH¢230 million inherited from the previous administration, which resulted in Ghana being blacklisted, had been paid under the able leadership of President Akufo-Addo. Mr. Agyemang stressed that the huge debt burdened students who were studying outside the country. “As at the end of December 2016, there was a debt of GH¢230 million. As I speak to you now, all have been cleared. We have paid everybody on Government of Ghana scholarships worldwide and students are so happy and are very thankful for the government’s commitment to education,” Mr. Agyemang added.